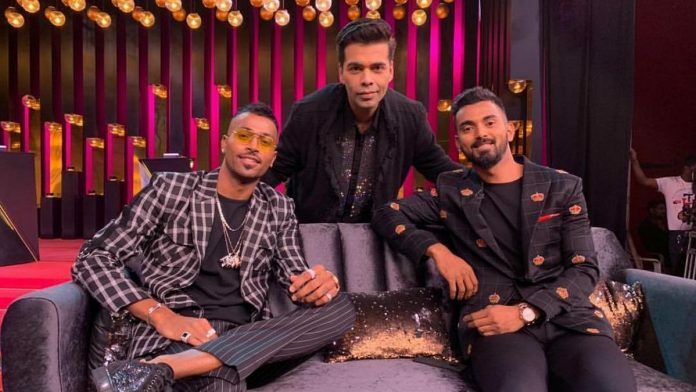 By dragging on the Hardik Pandya-K.L. Rahul suspension saga, the squabbling CoA members showed they could cause permanent damage to Indian cricket. It is public knowledge now that Vinod Rai and Diana Edulji — who comprise the Committee of Administrators for the BCCI — don’t get along. The most recent bone of contention between Rai and Edulji was the manner of hearing and quantum of punishment in the case involving the so-called poor conduct by two members of the Indian cricket team, Hardik Pandya and K.L. Rahul, during their appearance on Koffee with Karan. An email leak showed that Rai and Edulji’s feud has descended to a level where we can call it petty and childish. The next time these two knock on the doors of the Supreme Court, like two school kids fighting over stolen toys, the apex court judges may be tempted to send them to a juvenile court to settle their frivolous arguments. In fact, the backdrop used this season for Karan Johar’s show has the words “Stop Making Sense” written on it in bold. While Pandya and Rahul only appeared in one episode of the show, Rai and Edulji seem to have made “Stop Making Sense” their guiding principle of governance. Eventually, both players’ suspensions were lifted because the BCCI does not have an ombudsman who is supposed to adjudicate on such a matter. But by then, it was clear that keeping them suspended indefinitely was an overreaction to an indiscretion by immature youngsters. While many found the things said by Indian cricketers on the show stupid and crass, it remains open to contention whether taking action over poor conduct on a TV show, where the players are not representing the Indian cricket team but talking in individual capacity, comes under the BCCI’s jurisdiction. As per the leaked email conversation, BCCI’s legal aide reminded the CoA that the Code of Conduct is only applicable to players’ on-field behaviour, and only those off-field offences that involve an opposition, teammate, or match official. If the CoA still wanted to send across a tough message to the players, it could have suspended the two players for two matches and closed the matter, especially given that the two players in question publicly and unconditionally apologised for their misconduct. The public outcry also led to the cancellation of an endorsement deal Pandya had with Gillette — losing endorsement deals is in itself enough of a deterrent for players to stop acting in a similar manner going forward. The case called for statesmanship from the administrators of the game. They needed to show that they were sensitive not just to public opinion but towards the players as well. The two players involved here are youngsters with a lot of promise for the future and are an essential part of India’s game-plan in a World Cup year. Pandya was just coming off an injury layoff that kept him out of the game for months. Rahul was fighting bad form and spending hours upon hours in the nets to regain his touch. Any competitive cricket for them would be invaluable. Punishment for their misconduct may have been justified, even warranted, but the CoA subjected Rahul and Pandya to mental trauma and agony. Such treatment had the potential to destroy their careers. Remember how Andrew Symonds could never be the same cricketer again after realising that his employers were not willing to stand with him in the ‘Monkeygate’ incident? It’s a pity that cricket boards across the world are monopolies. If you go against your home board, it’s possible that you even won’t get to play club cricket anywhere in the world. Pandya and Rahul had no option but to bow their heads and listen to Edulji saying that if they missed the World Cup due to the pending enquiry, so be it! It’s downright painful to read the contents of Edulji’s emails. As a former cricketer herself, you would have expected her to have more sympathy towards the players’ dressing room than the administrators’ boardroom. The incidents she chose to justify her stand showed how out of touch she is with the game. In her mail, Edulji exhumed the Lala Amarnath incident from 1936, when the Maharaja of Vizianagaram, who was the touring captain on India’s second tour of England (not because of his cricketing prowess but his lobbying skills) sent Amarnath home for confronting him. Recalling this incident in her mail only served to prove one point, that Edulji is probably as incompetent as an administrator as ‘Vizzy’ was cricketer and captain. Imagine asking the Supreme Court for an ombudsman to decide a trivial case of indiscipline and indiscretion. Would a Jagmohan Dalmiya ever have to do something like this? A few discussions, a few tough words, and a few pats on the shoulder could have solved the matter. The CoA, though, inflated a minor problem into a proper crisis. This is not the first case where the hypocrisy and virtue signalling from the current BCCI regime has come to the fore. Remember when Mohammed Shami’s wife levelled unsubstantiated allegations against her husband on a TV channel, and the BCCI had promptly sprung into action even before police complaint was made and put Shami’s contract on hold? This wasn’t the sexual harassment case that the BCCI CEO was accused of — it was a domestic conflict between Shami and his wife that should have had nothing to do with his employers. The CoA needs to understand that unlike the administrators who can easily earn a living in another field, cricketers only have one skill and one livelihood, and that is to play the game. A decision that prevents a player from playing the game should be taken only when you have a proper and compelling justification. The appointment of the CoA two years ago happened at a time when Indian cricket was flexing its muscles in the world game, both as the number one team in the world and as the financial powerhouse of the game. If Australian cricket’s decline in recent years is anything to by, India can’t take its position for granted. The CoA had a mandate to reform the BCCI and then make way for an elected head. Based on its poor handling of the Pandya-Rahul issue, and before that, of the altercation between women’s team coach Ramesh Powar and Mithali Raj, Rai and Edulji would be well advised to leave their positions at the earliest and allow the BCCI to run itself as a self-governing, democratically-elected body. I know nothing about this case. But this photograph — two cricketers and Karan Johar — has appeared in THE PRINT so, so many times, over so many days, that I wonder if this publication is not veering towards triviality. Not just this, there is so much stuff on Bollywood in THE PRINT these days that again makes me wonder if its editors believe that Bollywood represents serious cinema! I use the word ‘serious’ because many other articles in THE PRINT bring this word to mind. Something is not jelling here. It is also time, the India media persons stopped peddling India = Cricket = Sport theory and started giving due publicity to other valiant sportsmen who are slogging it out to bring glory to the nation. In the last one year I have not seen a single article on any other sport on this website. Is there no policy of fair coverage of sports?